Grass is a naturally occurring resource that is present in the Spring, Summer, and Fall seasons. At the start of the game, the player's farm has many unconfined fields of grass. Each day, new grass tufts will grow around existing grass. Grass can be cut using the scythe. Once the player constructs a silo on their farm, each grass cut has a 50% chance of providing hay, which is automatically stored into the player's silo(s). Although grass can occur naturally, the player can choose to start a new patch using Grass Starter. This will place a single tuft of grass, which will spread into additional tufts over time. 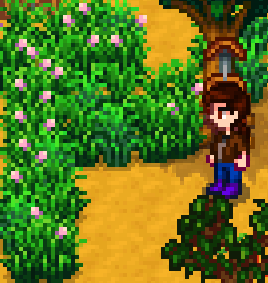 Occasionally, grass will spawn randomly on unoccupied tiles on the player's farm overnight. These tufts will behave in the same way that player-planted tufts will behave. Tip: Paths, fences, closed gates, or pieces of furniture (such as chests or braziers) should prevent the spread of grass through the tile it occupies. However, some materials, like the stone fence, do not always operate this way. It is possible to exploit this by sectioning off patches of grass in animal enclosures, preventing them from eating all the grass in the area. This allows the grass to regrow more quickly, stemming from the fenced-off source patch. Each fully grown grass tile consists of 4 tufts of grass. Each day, every individual tile containing grass has a 65% chance of growing. If the tile containing grass has less than 4 tufts and succeeds a growth check, it will grow 1-3 additional tufts of grass. (randomly determined) If a fully grown grass tile succeeds a growth check, it will check all 4 adjacent tiles. If they are tillable, there is a 25% chance for each tile for 1-3 tufts of grass to grow. This page was last modified on 5 October 2018, at 22:05.